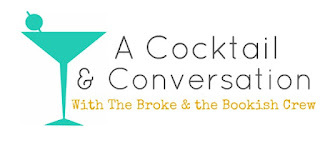 Every other(-ish) Thursday here at the Broke & The Bookish is A Cocktail & Conversation time. 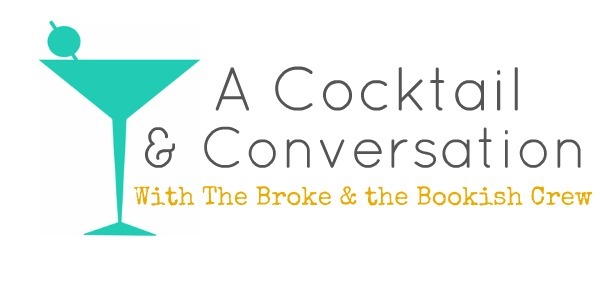 One of the TBTB members will pose a question to 2-3 of the other members of TB&TB crew about books, life, music, etc and then they'll answer and we can converse about it. So grab a cocktail & cozy up for some conversation. It's 5 o'clock somewhere, friends. What would you say your biggest hobby outside of blogging is? Kimberly says: My biggest hobby outside of reading is theatre. Acting, directing, techie stuff. Right now I'm working as stage manager for the musical version of Anne of Green Gables. We're a week away from opening. It's been great! Stage managing encompasses a lot of different jobs, things you wouldn't even think of. It's crazy and exhausting, but I love it! Our cast is pretty amazing, and our Anne is absolutely PERFECT. I'm excited to open next week and have an audience! Kelly says: My biggest hobby would most likely be music. If my nose is not in a book, my headphones are plugged in my ears (I find it difficult to do both at the same time unfortunately). I play the piano and half heartedly attempt the guitar (it HURTS!). Even though I play pretty badly, it's a rush. I still buy CDs and have a collection almost as big as my bookshelf. My iTunes collection is off the charts. When my favorite artists release a new album or I find new songs it's like Christmas. Music can create memories and experiences for me that are all my own, something I find that books can't really do." What about you guys? What is your biggest hobby outside of reading? I would love to hear from anybody who has a really unique hobby!! Kimberly, I took musical theatre and tech theatre in high school and LOVED it. Theatre was my life for the longest time and I miss it now that I'm in university. So I'm quite jealous of you -- I'm sure your show will be splendid! Kelly, I hear you. Music is a big part of my life too. Whenever I'm baking I have 8tracks going on in the background and my iTunes is in the thousands. And I can't stop finding more music! It's such a thrill when you find a new artist to love. Like Kelly, my biggest hobby outside of reading is music. Listening to it, writing it, singing- I love it! Either music or just writing. I love actin as well! I would say .. baking and taking care of my kids lol . I also help at my kids schools either in the classroom or library. Gosh this is hard. I think I'd have to go with writing, baking and music.I'm working on a book so of course writing is in there. I find baking to be cathartic for me. If I'm in a bad mood,baking helps. Listening to music is a big one. My whole family are music lovers so that helps. Baking totally helps me when I'm in a bad mood as well :) It's nice to create something and having it be yummy goodness helps as well! Writing. I would love to cook and bake more, but it's hard living at home. I'm (finally) moving out on my own this year and am excited to have my friends over to reciprocate all the meals they've made for me over the years. Oh definitely! My mom would pretty much hand over the kitchen if I wanted to cook, but I started experimenting when I got my own place! Running. So much so that I gave up my blog for the summer so I could run more! Reading and writing aside, I've always been fairly athletic. While football (aka soccer) was always my preferred sport, I ran track and played volleyball as well. I also had a knack for rollerblading and hiking but, of late, I've gotten into archery. I'm talking, like, Katniss-style archery with a traditional recurve bow. It's surprisingly cathartic and a whole lot of fun! Kimberly: I wish I could act. Seriously, you are truly awesome for just getting up on a stage and doing that! And stage managing sounds awesome!! Exhausting, but awesome!